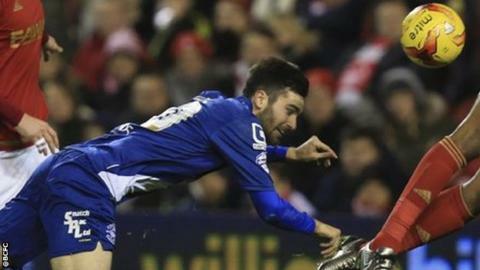 Matt Mills cancelled out Jon Toral's opener to hand Nottingham Forest their fourth draw in a row. The Spanish midfielder stooped to head in Paul Caddis' cross to give Birmingham the lead. But their advantage lasted just six minutes as Mills climbed highest to nod in David Vaughan's free kick. Toral struck the post with a deflected effort from 25 yards as the Blues pressed for a winner, but Forest held out. Forest had almost taken an early lead when Ben Osborn bought himself space on the edge of the area, but his shot struck the post. Birmingham's lead came against the run of play as Toral converted the visitors' first opportunity, but Mills' rapid equaliser ensured Forest deservedly recovered their 12th point of the season from a losing position - the most in the league. Forest's David Vaughan saw red for a high tackle on Clayton Donaldson, but Birmingham could not make the extra-man advantage count to claim a fourth win in five. They remain 14th, while Birmingham stay eighth. Nottingham Forest boss Dougie Freedman: "We didn't start very well, which was very unlike us at home, but we got the goal back, although nothing much happened for us in the second half in terms of creativity. "Credit to the lads for keeping on going after coming back from a setback. We had to dig in and we will take the point." Birmingham boss Gary Rowett: "The City Ground is never an easy place to come to, so I was very pleased to go 1-0 up early on, but I was disappointed to concede a goal so quickly, especially from a set-piece. We are usually very good defending set-pieces and I also thought it was a soft foul leading up to the free-kick, but we should have dealt with the situation. "I expected Forest to come out firing at 1-1, but it never really happened and I felt it was us who moved the ball around well and got into some very good positions, without having lots of chances. "It was probably a fair result, but I felt we should have capitalised in some moments with some more belief and quality." On David Vaughan's dismissal: "It was a little bit reckless, he stuck his foot up into Clayton's face, but I don't think it warranted a red card. If we had won the game on the back of that red card, I think it would have been slightly unjust." Match ends, Nottingham Forest 1, Birmingham City 1. Second Half ends, Nottingham Forest 1, Birmingham City 1. Attempt missed. Oliver Burke (Nottingham Forest) left footed shot from outside the box is high and wide to the left. Paul Robinson (Birmingham City) is shown the yellow card for hand ball. Hand ball by Paul Robinson (Birmingham City). Substitution, Nottingham Forest. Oliver Burke replaces Chris O'Grady. Hand ball by James Vaughan (Birmingham City). Attempt saved. Clayton Donaldson (Birmingham City) right footed shot from outside the box is saved in the top centre of the goal. Assisted by James Vaughan. Gary Gardner (Nottingham Forest) is shown the yellow card for a bad foul. Attempt saved. Maikel Kieftenbeld (Birmingham City) right footed shot from outside the box is saved in the top right corner. Assisted by David Davis. Substitution, Birmingham City. James Vaughan replaces Jon-Miquel Toral because of an injury. Attempt missed. Jonathan Grounds (Birmingham City) header from the centre of the box misses to the left. Assisted by David Davis with a cross following a corner. Corner, Birmingham City. Conceded by Bojan Jokic. Substitution, Nottingham Forest. Gary Gardner replaces Ryan Mendes. Dorus de Vries (Nottingham Forest) is shown the yellow card. David Vaughan (Nottingham Forest) is shown the red card. Attempt missed. Jamie Ward (Nottingham Forest) left footed shot from the centre of the box misses to the left. Assisted by Chris O'Grady with a cross. Substitution, Nottingham Forest. Jamie Ward replaces Nélson Oliveira. Corner, Birmingham City. Conceded by Matt Mills. Attempt blocked. Jon-Miquel Toral (Birmingham City) left footed shot from outside the box is blocked. Assisted by Jonathan Grounds. Foul by Ryan Mendes (Nottingham Forest). Attempt blocked. Jacques Maghoma (Birmingham City) right footed shot from the right side of the box is blocked. Assisted by Jon-Miquel Toral.